Welcome to the new home of Pinch My Salt! I am in the process of moving from my original site located at wordpress.com and during this transitional period, things might look a little crazy around here! This site will be undergoing lots of renovation in the next couple of months but if you can hang in there and bear with me as I try to get things figured out, I promise that soon you will have a new and improved Pinch My Salt! If you would like to subscribe to Pinch My Salt by e-mail, click here. « Any Foodies out there using Twitter? I am so proud of you and all you have done with Pinch My Salt! I can't wait to see what is going to happen in the future! Good luck! Love ya! Wow...cool! Love what you've done with the new site. Yes, maam! Looking better already. Consistent fonts, bold titles. I love it. Feels free and clean. I look forward to it's development and more videos by that collective chicken guy! Looks great, Nicole! Congrats on the move. Emon, Jonathan, and Genie: Thanks! I was really nervous about making the move and I'm feeling a little overwhelmed :-) But, I'm getting things figured out and am looking forward to playing around with the new design! It looks wonderful! I like everything about the look of the new site. Congratulations! Congratulations on your new domain! There's nothing better than owning your own space. I look forward to viewing more of your beautiful food photography in the days and months to come. Congratulations on your new website. So did u finalize ur trip ?? I like the new comment balloons... Congrats on the successful move. Looks great Nicole, but didn't expect anything else from you! thanks for letting us know about the move! 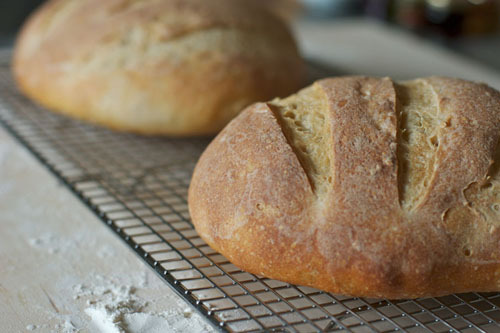 the site looks great and my god that bread looks like shear artisan mastery. i hope you post the lamb kabobs.... mmmm yogurty meeeeat. i forgot to mention in my post-work fried state that both tyler and i are very happy to see your husband return safely to you! take care! lovely, easy to read and clean! perfect. Very cool comment balloons! Will stay tuned to see what else you have in store for us. The new look is great! Your photography is sooooo good Nicole. It was a pleasure getting to meet you in person. We had a nice visit while in Sicily. The traffic was a real experience...:) You are one brave girl for driving in it. You certainly have a nice talent, we look forward to seeing more. Welcome to the new address, Nicole. Very uptown! I need to make the move too. I'm sure I'll be picking your brain about it sometime soon--not as painful as it sounds. Congratulations, Nicole!I can't wait to see all the changes that you make and of course you know I'm always eager for your posts and photographs! The place already looks comfy and cozy, Nicole. Looking forward to all the other trimmings you will be adding and to many continued visits. Hey, this looks great! How do you always take such good pictures?? Anyways, I like the new look and can't wait for some new recipes...Congratulations on the move! Christine: Thanks for stopping by!Terry: Thanks! Feel free to e-mail me any time about the moving process!Ivonne: Thanks for stopping by! I'll be e-mailing you soon to talk about the ins and outs of using wordpress :-)Cynthia: Thanks! I'm already starting to feel very comfortable here!Shea: Thanks :-) I have to give a lot of credit to my nice new camera for the photos! Ruby: hehehe...notice I used my nickname?